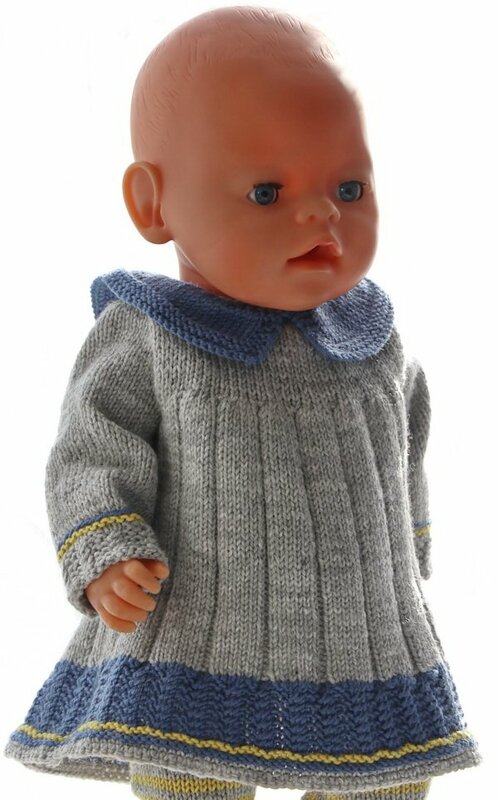 This time I have knitted another outfit especially for your doll. I went to France for a holiday and of course, I had to bring some knitting. I did not really know what to knit but I found some yarn I had at home. 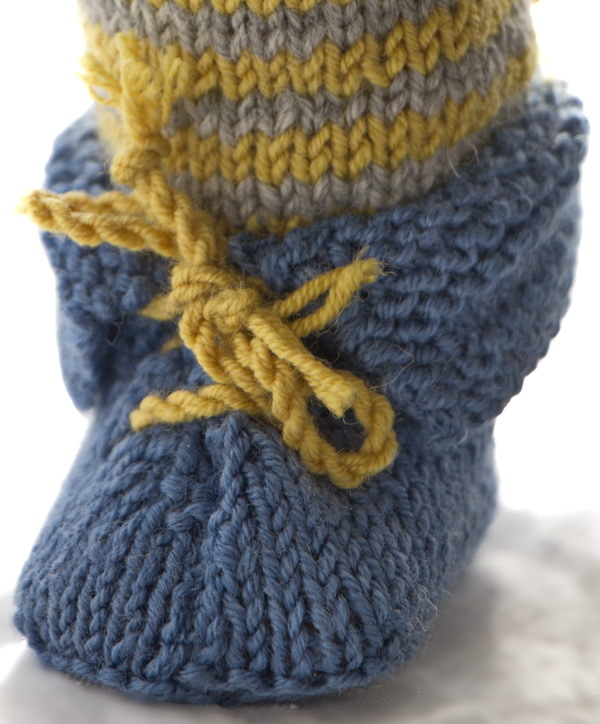 I love this soft Thin Merino Wool from Sandnesgarn and found some left over yarn in blue and yellow together with some yarn in grey. 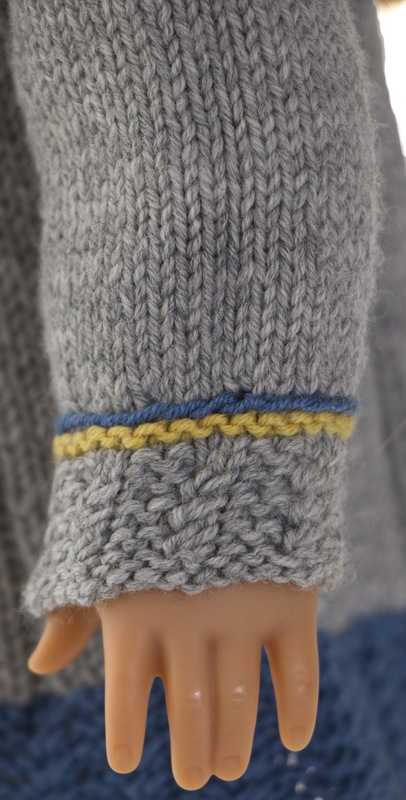 I started knitting the sleeves in grey and knitted a little pattern with very small cable between garter sts. Above the pattern, I knitted a row/ ridge in yellow in ga before knitting the rest of the sleeve in grey. Then after knitting the sleeves, I thought that a pattern with the same small cables would be fine for a dress. I casted on for a dress in blue, knitted a row/ridge in yellow and then an edge in blue with the pattern. 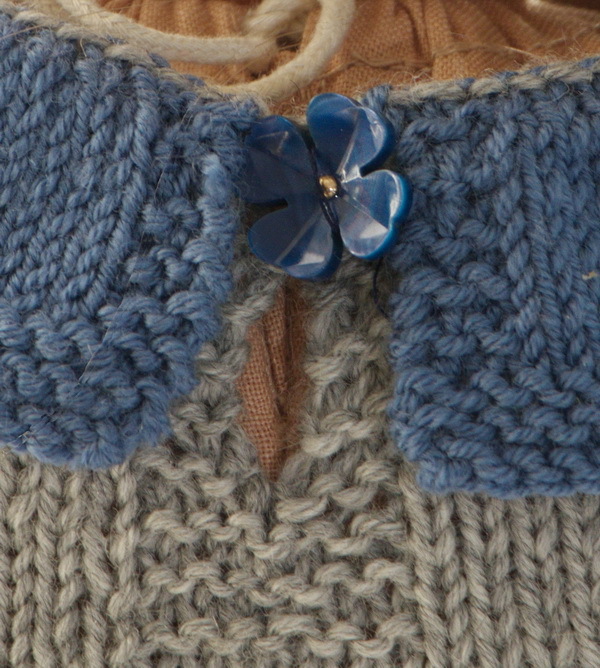 The dress is buttoned back with a blue flower button. I really liked it and after knitting the edge in blue, I decided to knit the dress in grey. I knitted st st and purled small stripes between. The waist is high up on dress and with a blue collar. I found this dress to be superb for your doll. Looking at the dress, I thought striped leggings would do as accessories. 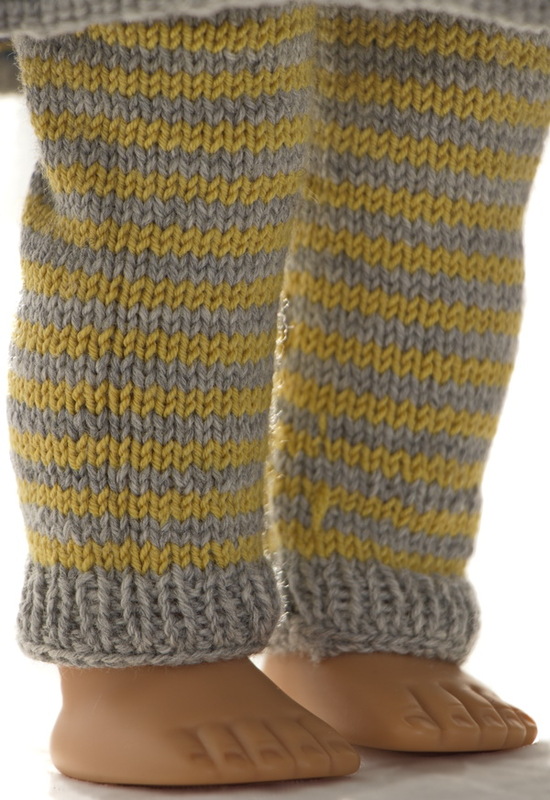 I knitted the leggings in grey and yellow, which looked nice to the dress. Then I got an idea about a bow like the one we had when we were little girls could do. I knitted a simple blue hairband. Then I knitted a yellow bow and sewed to the hairband. Over the bow, I sewed a little crocheted flower. Round the edge, I crocheted 2 rows dc in grey. Above the yellow ridge round the sleeves, I sewed a row with backstitches in blue. This hairband was perfect as accessories to these clothes. 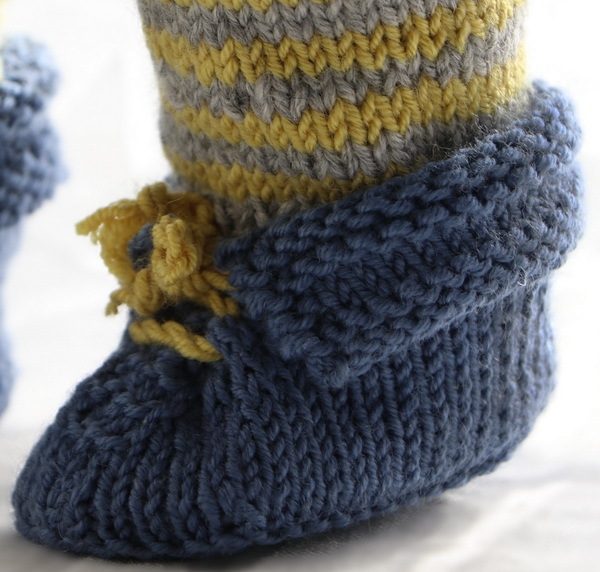 At last, I knitted a pair of shoes. The shoes have eyelets along the side’s front just like small shoes. Then I made two yellow bows, put these through the eyelets just as we do for shoes, and bound them in a bow. This way I arrived back at home with this set of doll clothes in the suitcase. 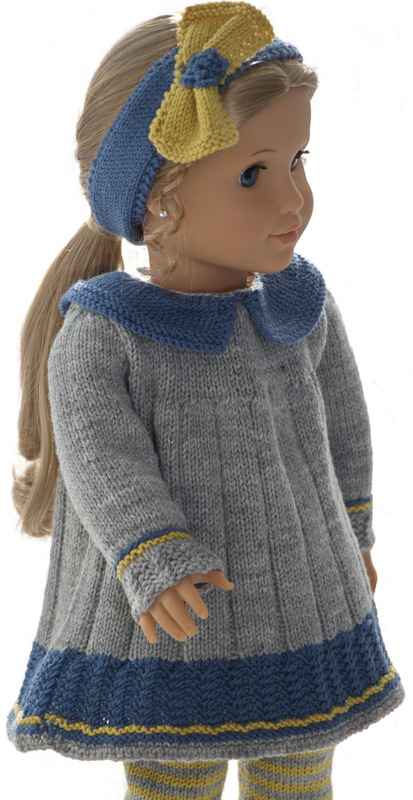 I hope you will like the clothes and want to knit them to your doll.